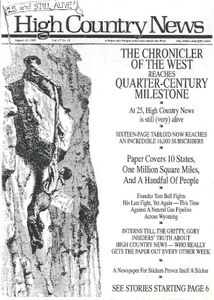 As HCN turns 25 years of age, HCN founder Tom Bell fights the proposed Altamont gas pipeline, which he says would harm the historic Oregon Trail at South Pass. Tom Bell calls the Altamont pipeline "a disgraceful example of government integrity gone awry." HCN editor Betsy Marston reminisces about the early days of the paper after it moved from Lander, Wyo., to Paonia, Colo.
Former intern Auden Schendler recalls life at "Intern Acres" in Paonia. Hotel Employees and Restaurant Employees Interaction Union gets off to a slow start organizing in Santa Fe, N.M.
New bimonthly magazine "Edging West" is reviewed. Citizens Against Lawless Logging protest emergency salvage timber sales in Montana. Improving Rangeland Production conference set for Sept. 11 in Delta, Colo.
Great Old Broads for Wilderness plans hikes in support of America's Redrock Wilderness Act. The quarterly "Workbook" takes a look at Mexican and American border communities' environmental problems after NAFTA. Group Sonoran North fights development north of Phoenix, Ariz.
Montana's Environmental Information Center meets Sept. 23. Oregon's Natural Desert Association hosts Hart Mountain National Antelope Refuge Fence-Out, Aug. 24-27. Camping on Green River 20 years, hog raising in Clark County, Wash., Arizona shows what it can do, federal land managers shoot guns rarely, porcupine race in Oregon, pity poor Texas, rodeo cowboys' unions, RV hardships. Senior editor Ray Ring leaves HCN and Paonia for Bozeman, Mont. Emery County, Utah, hires art restorers to remove graffiti from prehistoric rock art in Buckhorn Wash.
A pipe bomb discovered by hikers in July marks the fourth time a bomb or explosive has been found in the Gila Wilderness in the past 13 months. Altamont is the rural West in microcosm, writer says.